Each time a consumer-grade 3D printer crosses my desktop, I mentally cross my fingers, hoping it will be a really top-notch machine despite its relatively low cost. I honestly root for the technology because I understand how revolutionary it is. Unfortunately, I'm nearly always let down. Until now, XYZprinting's machines were no different. The company, which has made its reputation on producing some of the industry's least expensive 3D printers, has struggled with quality. But last month, when the company announced the da Vinci Mini 3D printer, I was hopeful that this time the printer would live up to its promise. For less than $300 -- about $290 (vendor price) or $270 (Amazon price) -- a beginner hobbyist, school teacher or small business product development team will get a no-frills machine that's intuitive to use and able to produce mostly accurate, good-quality objects -- even multiple builds at the same time. The new da Vinci Mini comes with several features that are often associated with much more expensive 3D printers, such as embedded Wi-Fi, which allows users to transmit object files from their computers to the machine over wireless networks. It also has onboard data storage, which allows a maker to upload an object build file to the machine via a USB cable and then unplug and walk away as the machine constructs it. Unlike the next 3D printer up on XYZprinting's totem pole -- the $349 da Vinci Junior, which I also reviewed -- the da Vinci Mini has no onboard LCD or pressure-sensitive menu that lets you select functionality. Instead, all functions are controlled from your USB- or Wi-Fi-connected computer using XYZWare, the company's proprietary management software. The Mini's print platform is also open-air and not enclosed with a transparent door like the company's other machines. The da Vinci Mini is 30% smaller than its predecessor; it weighs just 24.25 lbs. and measures 15.75 x 13.23 x 14.25-in., so it is easy to transport and doesn't hog much desktop space. Its print build area is the same as the da Vinci Junior at 5.9 in. cubed. The machine is compatible with computers running Windows 7 and later, and Mac OS 10.8 and later. Computers can connect via USB 2.0 or a home wireless network. The Mini can print using three formats: .STL, .3W (XYZ's format) and .3MF. While the da Vinci Mini has no LCD screen, it does have a bar that can be pushed to pause a print job and an LED that indicates printing conditions through various colors. For example, green means that the machine is in standby mode while red means the machine has experienced some sort of printing error. One thing I really like about XYZprinting's machines is they all have onboard memory, so once an object is downloaded to the machine, you can unplug your computer and walk away. Other machines I've reviewed require you to keep your computer attached until the print job is completed. In my opinion, a tethering requirement is a non-starter. 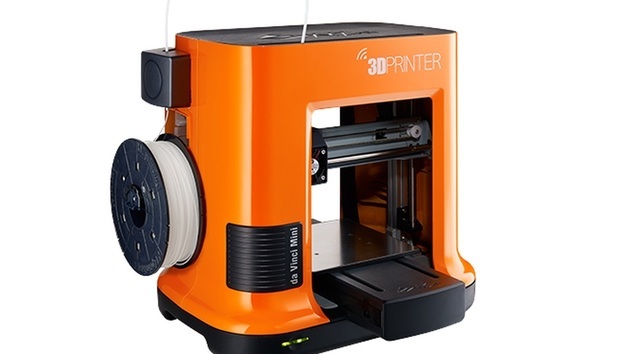 The Mini can only use one type of filament: the popular polylactic acid (PLA) in a standard 1.75 mm diameter, which is fine for an entry-level machine. Spools of PLA aren't terribly expensive -- a 1.8-lb. spool costs about $23. However, here is my biggest complaint with XYZprinting: Filament lock-in. XYZprinting requires the use of its filament spools and no others for its printers. The company locks users in by inserting a computer chip in filament spools that, while allowing users to monitor filament usage, also keeps them from refilling spools on their own. You cannot reset the chip or operate the machine without a chipped filament spool. When you are out of filament, you must reorder another spool of filament and that spool will arrive with a new chip. "We do this because ... we make 3D printers for the average consumer, and we want to make it easy and accessible for people," an XYZprinting representative stated in an email response to Computerworld. "If it was an open-source printer, beginners would be struggling to match the correct temperatures to the filament, and this can result in clogs." PLA filament, which commonly comes in a 1.75mm diameter, melts at roughly the same temperature no matter who manufactures it, so I can't agree with the explanation that users would somehow struggle to make other PLA brands work in their machines. I would even be more apt to buy into XYZprinting's explanation for proprietary filaments if it wasn't for the fact that its higher-end intermediate and professional models also use a chipped, sealed cartridge that cannot be refilled with third-party filaments. That said, the da Vinci Mini does boast impressive resolution with that PLA filament (resolution refers to the thickness of each layer of melted filament that it lays down). The resolution, which is the same as the more expensive da Vinci Junior, can be adjusted from 0.1 mm (100 microns) through 0.4 mm (400 microns). The default setting is 0.2mm. Like other XYZprinting 3D printers I've reviewed, unboxing and setting up the Mini was a snap. The only hang-up I had was in initially pushing the thermoplastic filament through the feed mechanism. For some reason, there was a lot of resistance and it took me a good three to four minutes to force it all the way through a guide tube before it reached the heated printer extruder. Once the filament was loaded, however, the machine went about its business without a hiccup. When it began to print, the first attribute of the da Vinci Mini that struck me was how quiet it was. After having reviewed more than a dozen 3D printers, I can tell you some are intolerably loud and must be placed in a separate room with the door closed or you'll be tempted to pull your hair out. Others are whisper-quiet, but they are usually more expensive or have enclosed printing areas. This printer is open air and yet it is among the quietest I've ever used. XYZprinting's proprietary 3D management software -- XYZware -- allows very basic position manipulation of an object once it has been loaded onto the virtual print bed and offers the ability to scale the object's size. You can also add multiple 3D model files to a single print job as long as they don't exceed the maximum 5.9-in. cubed print volume. The chess pieces as seen in XYZprinting’s XYZware management software, prior to printing. That said, I had no issues with the machine's default settings in producing quality prints. My first test of the da Vinci Mini consisted of printing a spiral-shaped vase that I downloaded from XYZprinting's online design community. Considering the design had been vetted by XYZprinting, I expected it be a successful print, and it was -- but more than that, I found the resolution on the piece to be impeccable. The da Vinci Mini handily printed a spiral vase, the file for which XYZprinting supplied with the machine. My standard test for 3D printers is to have them build a 6-in. Eiffel Tower model. The da Vinci Mini was able to accomplish the task in 1 hour, 40 minutes, which was impressive. Not so impressive was the actual build, which did accomplish the tower but with so many printing errors that it came out missing scaffolding sections and with a good deal of disarrayed filament. Still, I've seen far worse from far more expensive 3D printers, so I have to give the da Vinci Mini a solid C for effort on the Eiffel Tower build. While this machine may not be able to replicate the most intricate of details on a build, it gets most right, and that's impressive for a sub-$300 printer. The Eiffel Tower print job was less than perfect, but sufficient, especially for a machine in this price range. By comparison, XYZprinting's da Vinci Junior failed rather spectacularly in trying to print the Eiffel Tower; its result was a mess of filament barely resembling the precise virtual model it from which it printed. Another challenging test of a 3D printer is making multiple objects simultaneously. I printed four Pokemon-style chess pieces on the Mini, which took three hours, two minutes. The pieces, which have Pokemon character figurines atop them, came out as well as any other desktop fused-filament fabrication printer I've tested, even vastly more expensive machines. And, the pieces were spot on representations of the .STL files from which they were printed. The most impressive print job consisted of four chess pieces that were printed simultaneously. My last test for the da Vinci Mini was another chess piece, but this time it was a rook with a spiral design on its outside. The design, something like a swizzle stick, wraps around the piece and can be a challenge for 3D printers to replicate. On top of that, I decided to upscale the size of the chess piece to see if the machine would still accurately reproduce it. In short, it did. One shortcoming of the lower-end da Vinci 3D printers is their print beds, which are made of aluminum and require the user to cover the surface with masking tape for better adhesion. XYZprinting even recommends you slather the masking-taped surface with glue stick to increase adhesion. And with all that, some models still tend to break away during a print, which is disappointing, especially when the model is almost completed. For most of my prints, however, the models held tight and were easily removed once finished. Like the da Vinci Junior before it, the Mini is a relatively slow printing machine. It is, however, slightly faster than its predecessor. It took one hour and 20 minutes to print an octopus figurine that had a 3-in. diameter and about 1-in. height; the Junior took 12 minutes longer to print the same model. That, however, compares to another 3D printer I reviewed -- the Lulzbot Mini -- which needed just 30 minutes to produce the same figurine. However, the Lulzbot Mini, which has become my benchmark machine, is a $1,350 printer. While less expensive than the da Vinci Junior, and with fewer bells and whistles, I believe the da Vinci Mini is a superior machine. The da Vinci Mini produces average-to-high-quality printed objects with above-average resolution. While slower than much costlier 3D printers, this machine is also faster than its predecessor and is able to create higher quality printed objects. I don't recommend many 3D printers, as I think most deliver far too little value, especially in light of exorbitant pricing. The da Vinci Mini really delivers for a sub-$300 machine, and it is one of the few I can heartily recommend for any beginner maker.